In an expanding global waterbased coatings market serving an array of industry verticals, majority shares are reserved by a handful of large players, states Transparency Market Research (TMR) in a new report. Top companies namely PPG Industries, Sherwin-Williams Company, and Akzo Nobel NV held 55% of the overall market in 2015. Product innovation and development of existing products remain the focus of leading companies in this market. These companies are pursuing product innovation initiatives through self-owned R&D facility thereby aiding to expand product offerings. Strategic alliances and mergers and acquisitions is also the focus of key companies in water-based coatings market to increase share. Apart from this, focus on customer relationship, customized products also serve leading players to attain business objectives. 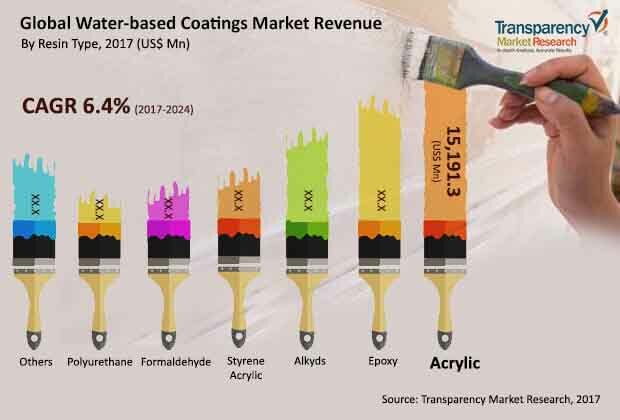 As per the TMR report, the global waterbased coatings market is likely to rise at a CAGR of 6.4% in terms of revenue between 2017 and 2024 for the market to be worth US$80.36 bn by 2024 end. The demand in the market translated into a revenue of US$51.74 bn in 2017. In terms of resin type, acrylic is the highly lucrative segment of the water-based coatings market; acrylic coatings are estimated to account for a revenue contribution US$24.3 bn by 2024 due to their extensive use in architectural coatings. By end-use, building & construction segment is anticipated to continue to lead hold the leading 59.5% share of the market by 2024. Asia Pacific, region-wise, holds prominence in the water-based coatings market. First and foremost, flourishing building & construction sector in Asia Pacific is fuelling the waterbased coatings market. Emerging economies such as China and India are touted to be key markets for water-based coatings. Rapid industrialization and urbanization have led to massive infrastructural development that requires paints and coatings. In addition, economic development leading to rising living standard in emerging economies have led to the construction of new residential units. These factors are anticipated to trigger the demand for water-based coatings in the building & construction sector. Several chemical compounds used across industries are associated with volatile organic compound (VOC) emissions that have environmental implications. This has led several governments to implement strict norms that monitor VOC emissions to be in permissible limits. As such, demand for eco-friendly alternatives such as water-based coatings is expected to be on the rise. Water-based coatings are low on VOC emissions over solvent based coatings. However, lack of viability of water-based coatings as water is a key component of corrosion is challenging the growth of water-based coatings market. Furthermore, sensitivity of water-based coatings for temperature and humidity fluctuations during curing phase of a construction project make unsuitable for some climates. Thus, the water-based coatings market is negatively impacted. Volatile prices of raw materials is hampering the growth of water-based coatings market. Raw materials account for major price component of paints and coatings. Thus, surge in the price of any of the raw material could significantly impact profitability. Water-based coatings contain fewer solvents, however, varying cost of raw materials could have a significant impact on the growth of overall market.